They huddle close, their feathery bodies touching, passing warmth and security between themselves. Two pairs of dark chocolate eyes are holes set inside white heart-shaped faces. I do not wish to disturb them yet I do not want to leave. This is my first encounter with barn owls and like a first kiss I want the moment to linger. The two birds stare at me. I stare at them. Do they wonder what I’m thinking as much as I am wondering about their thoughts? Its difficult not to put such anthropomorphic characteristics on creatures like these owls. Perhaps it is simply my wish to believe we are communicating in some fashion, communicating on a level I rarely am able to achieve with most people. 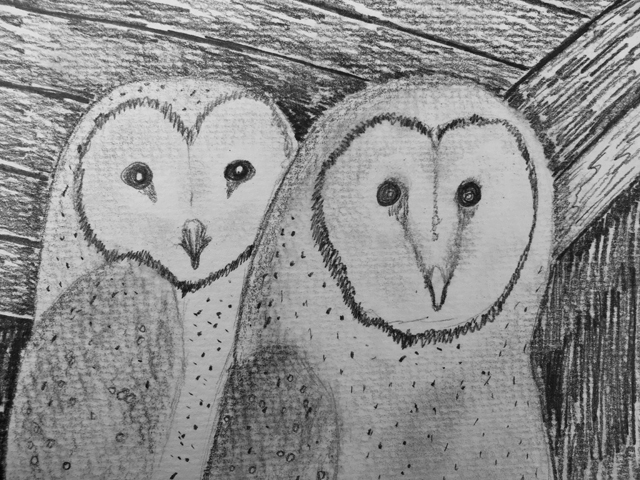 The owls see me in a way that people often do not — simply human. They place no labels on me, they pass no judgment. For this alone I am grateful. 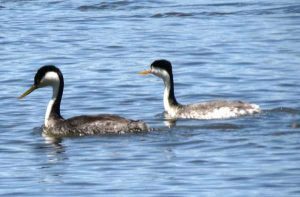 Western and Clark’s Grebes gather in early summer for an amazing mating ritual. Click on the link below to see a short video I produced. Author cstrijekPosted on June 9, 2017 June 10, 2017 Categories BirdingLeave a comment on Want to Dance? I sat on a high spot on the rocky bank, my back to the cool breeze, and waiting for the sun to break through the clumps of silver clouds. After weeks of walking challenging terrain while conducting bird surveys, I was content to simply sit. The river flowed wide, swiftly and noisily, as the water hit in-stream boulders. The din, however, did not overpower the cries of spotted sandpipers searching for food as they scurried along the bank’s edge and along potholes. I looked cross-river to take in the contrasting lime-green big leaf maples and alders with the forest green Douglas firs – all of them almost met the water’s edge. This was excellent habitat for a variety of birds, mammals and the tallest firs provided lookout posts for bald eagles and osprey in search of their next meal. As I continued to glass my surrounding, a figure popped out of the woods where the trail was. I watched this older man make his way to the water’s edge. A wide brimmed hat with a drawstring topped his head and shaded his grey and white bearded face. Black suspenders held his baggy pants up and his potbelly filled his midriff like a small beach ball. His gate was sure and stead, despite his age. 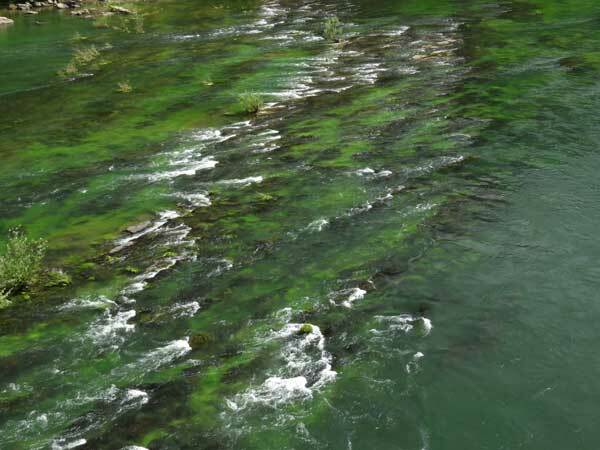 Once he reached the river he gazed intently into the water with dark sunglasses — clearly a fisherman searching for fish. As he came closer to me I read a patch on his shirt that read “Project Healing Waters.” I was familiar with the program that helps war vets with trauma through fly-fishing outings. We chatted a bit about his role in the organization, the condition of the river and general health benefits of fly-fishing. A brief silence fell between us as if to confirm the river’s power to heal. Then as he turned to take leave he said, more to himself than me I suspect, “Yup, might have to come back here tonight and do some fishing.” “Good luck,” I replied as my eye caught sight of a soaring osprey overhead. I hoped both would be having fish for dinner that evening.